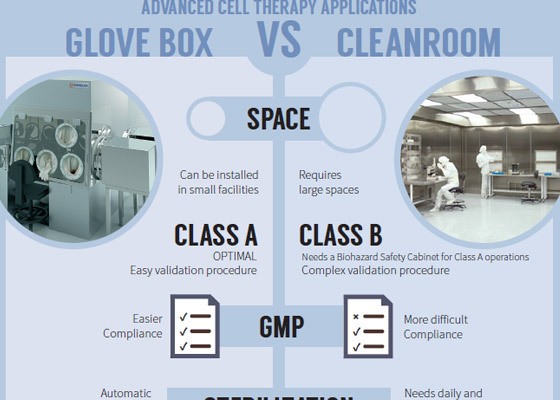 Glove Box vs Cleanroom: are Glove boxes better than Cleanrooms in Advanced Cell Therapy Applications? Here are two tools that can help you decide. The first is an infographic with a side-by-side comparison of the two technologies. The second is the fact sheet that follows with a series of bullet points divided by topic that list the advantages of isolation technology applied to regenerative medicine. Total sanitizing costs using a glove box: average cost of 1 L H2O2 cartridge is 7 Euro. Typical consumption is 1 cartridge per 5 cycles. Easier validation procedure with a glove box. Comparable yearly validation costs and building costs.